Hundreds rescued from floodwaters in Fla., Ala.
PENSACOLA BEACH, Fla. -- People were plucked off rooftops or climbed into their attics to get away from fast-rising waters when nearly 2 feet of rain fell on the Florida Panhandle and Alabama coast in the span of about 24 hours, the latest bout of severe weather that began with tornadoes in the Midwest. In the Panhandle on Wednesday, roads were chewed up into pieces or wiped out entirely. A car and truck plummeted 25 feet when portions of a highway collapsed. Cars were submerged or overturned and neighborhoods were inundated, making rescues difficult for hundreds of people who called for help when they were caught off guard by the torrential rains. 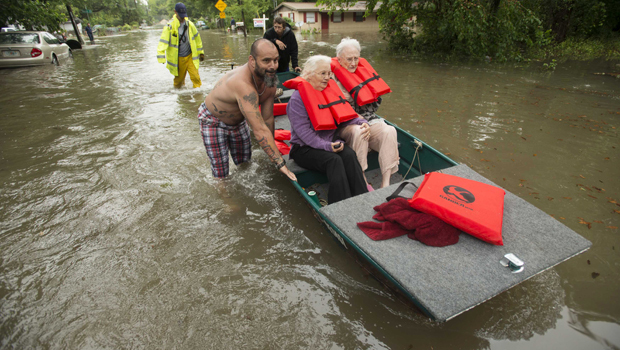 Boats and Humvees zigzagged through the flooded streets to help stranded residents. At the height of the storm, about 30,000 people were without power. One woman died when she drove her car into high water, officials said. In Georgia, officials reported one death in Athens. Police said winds pushed over a tree that crashed into a car, killing its driver at a mobile home park. Meteorologist Megan Glaros of CBS Chicago station WBBM-TV reports that the threat of more severe weather extends from Washington, D.C., to north Florida with potential for tornadoes, hail and damaging winds. The threat for flooding from heavy rains continues for the Panhandle and will encompass much of the East Coast for Wednesday into Thursday, Glaros reports. Kyle Schmitz was at home with his 18-month-old son Oliver on Tuesday night when heavy rain fell during a 45-minute span in Pensacola. He gathered up his son, his computer and important papers and decided to leave. "I opened the garage and the water immediately flowed in like a wave," he said. "The water was coming up to just below the hood of my truck and I just gassed it." Schmitz and his son made it out safely. He returned Wednesday to assess the damage at his rented home in the East Hill neighborhood. The water was up to his shins. In Alabama, Capt. David Spies of Fish River/Marlow Fire and Rescue said he was part of a team who found two women and a young boy trapped in the attic of a modular home. Spies said they received the first call of help before midnight Tuesday but they couldn't find the group until about 8 a.m. Wednesday. By then, the water was 2 feet below the roof. A firefighter used an axe to punch a hole through the roof and free them. "They were very scared, they were very upset. I would've been, too," Spies said. Florida Gov. Rick Scott said officials received about 300 calls for rescues. About 22 inches of rain fell in Pensacola - one-third of what falls in an entire year. National Weather Service officials were still sorting out official numbers because equipment that serves Mobile, Ala., and Pensacola lost power during the storm. Meteorologist Jeffrey Medlin said what they had recorded officially - more than 11 inches - would be the fourth highest total for a calendar day since 1879. Medlin said flash flood warnings were issued as early as Friday. Still, many people were caught unaware because the rain happened so fast. Elizabeth Peaden was at her weekly Bunco game Tuesday night. It wasn't raining on her way there, but on her way home, she drove her van through a flooded intersection and got stuck. "I was scared out of my wits. Water started coming in and I wasn't sure what to do," she said. Peaden waded her way to a nearby American Legion post where she and about 20 other stranded travelers spent the night sleeping on tables or the floor. At one point, officials said more than 100 people were at shelters. The widespread flooding was the latest wallop from a violent storm system that began in Arkansas and Oklahoma and worked its way South, killing 37 people along the way, including the 67-year-old driver in Florida. Pensacola Police Chief Chip Simmons said two vehicles fell 25 feet when portions of a highway that runs through residential neighborhoods along the city's bay front collapsed. The truck driver was fine, but a woman in a car needed help getting out. Neither had serious injuries, Simmons said. In Gulf Shores, Ala., where nearly 21 inches of rain fell in a day's time, the scene resembled the aftermath of a hurricane. At the Sportsman Marina in Orange Beach, employee J.J. Andrews couldn't believe what she saw out the window. "We've got water up in our parking lots," she said. "Our docks are under water. It's worse than during Hurricane Ivan, is what they're saying. It's crazy." The 2004 hurricane dumped 3 to 7 inches of rain along the Florida Panhandle. By Wednesday afternoon, water started to recede while the storm marched its way up the East Coast, bringing warnings of more flash flooding. Emergency officials in Maryland said crews rescued motorists who were stranded in high water. Authorities in Louisville searched until dark Tuesday for a missing 8-year-old boy after a large tornado killed his parents and destroyed their home. Though searchers didn't rule out finding the boy alive, officials described it as a recovery process. On Wednesday, Louisville officials said they were shifting priorities from response to cleanup. "Today is the day we start putting Louisville back together," said Buddy King, county emergency management director.